Download the The Ranches Golf Club mobile app to enhance your experience. Mobile apps contain many features like scorecard, GPS, tee times, news, deals and more! Click on the icons for more information and free download. Noted architect Steve McFarland, of the Ron Garl Design Group designed the course. This golf course was created as a challenging 7,085 yard course from the back tees with multiple tee boxes for players of all skill levels. Featuring a western theme, the course covers 220 acres in a true links-style. 150 bunkers, native grasses and mountings think you are in Scotland or Ireland 4 different sets of tees. Please call 801-789-8100 for current rates. Call 801-789-8100 for rates and tee times. Contact The Ranches Golf Club at 801-789-8100. Contact The Ranches Golf Club at 801-789-8100 for onsite or nearby dining options. 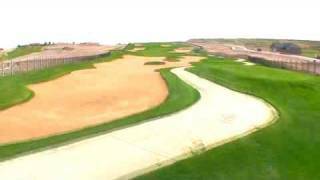 Watch the The Ranches Golf Club Video. This profile was last updated on 12/11/2017 and has been viewed 9,591 times.